"Great use of a fall vegetable. We have it every year for the holidays." Place squash, cut-side up, on the prepared baking sheet. Place 1 tablespoon butter and 1 tablespoon brown sugar into the cavity of each squash half. Bake in the preheated oven until skin is crispy and flesh is tender, about 1 hour. Cool until squash is easily handled, about 10 minutes. Scoop flesh into a large bowl; add remaining butter, brown sugar, and apple pie spice. Whip squash mixture with an electric mixer on medium speed until fluffy. Pumpkin pie spice can be substituted for the apple pie spice. If desired, put whipped squash into casserole dish and cover with marshmallows and put back in the oven for 15 minutes till brown. Can be made ahead and reheated in a 350 degrees F (175 degrees C) oven for 30 minutes. I love squash like this, and could sit and eat the entire thing! I did use pumpkin pie spice in place of the apple pie spice. It's only 1/8 tsp, so the taste is very subtle, which I liked. This was really good! 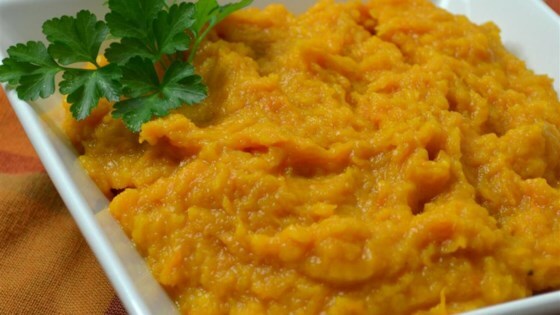 It tastes almost identical to mashed sweet potatoes and I? really like those as well! Made it using the pumpkin pie spice and it was a hit with everyone!